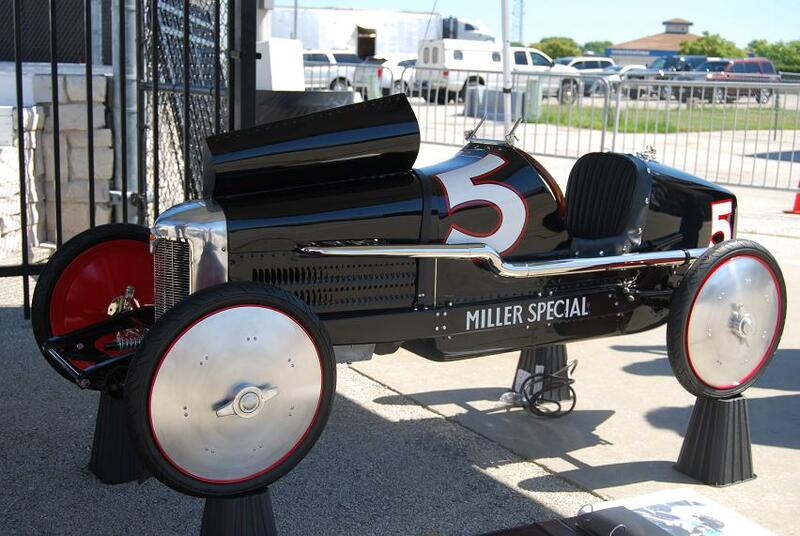 Robert Manhart’s background as an aircraft mechanic helped him to build the scale model Miller. 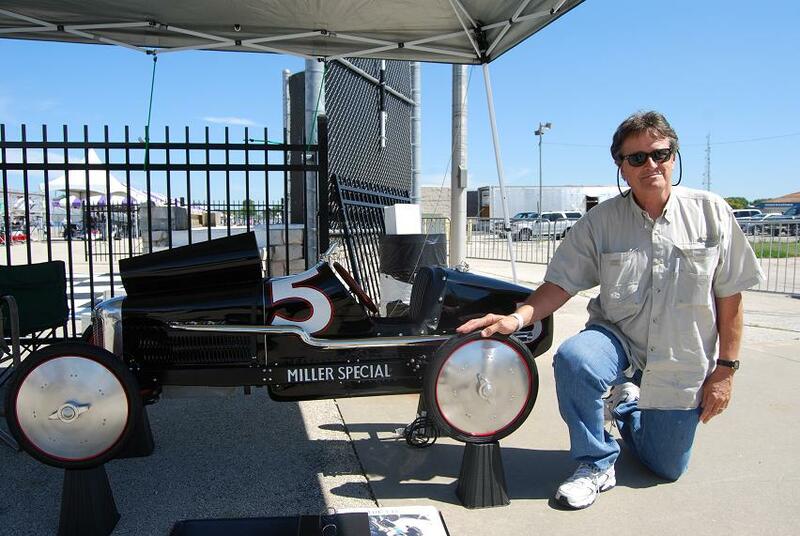 In early July, Robert P. Manhart of Ft. Meyers, Fla. brought a miniature model of a Miller racing car to the Millers at Milwaukee event at the Milwaukee Mile and classic car auctioneer Dana Mecum bought it from him. For Mecum, it was like Christmas in July, he couldn’t resist the gorgeous scale model. 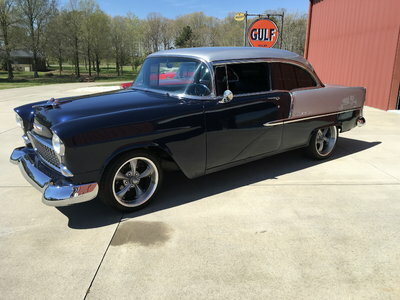 After all, Mecum is president of the Harry A. Miller Club (www.harrymillerclub.com). 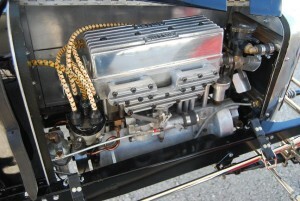 The tiny engine has a finned valve cover and period-appropriate braided spark plug cables. All of the gauges are fully functional. 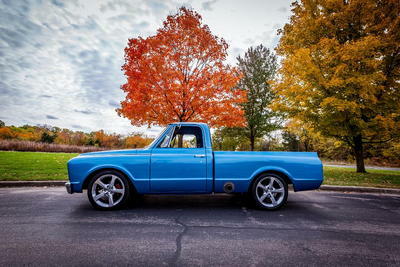 To fabricate the aluminum body, Manhart bought an English wheel. He later used it as a louver press as well. 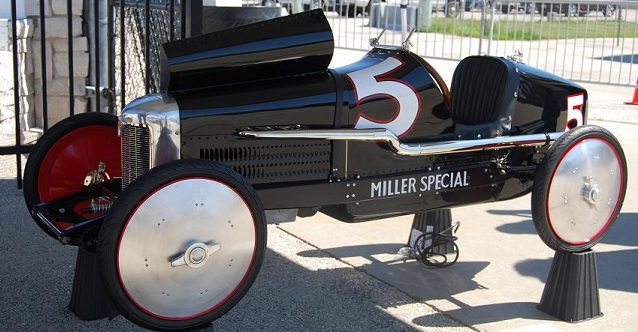 Wood cast parts were used to build the mini Miller. 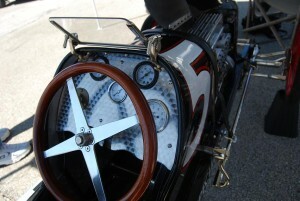 Manhart did the woodwork and the man who built the engine made the castings. 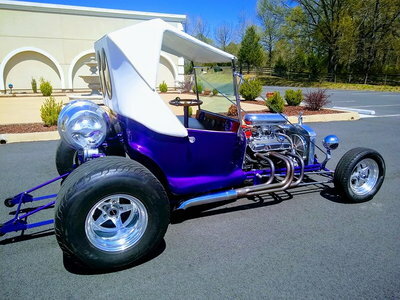 About 4,000 hours of labor went into the 4-ft. long racer. Manhart toyed with giving the model battery or pedal power, but wound up purchasing a tiny, but functional engine. 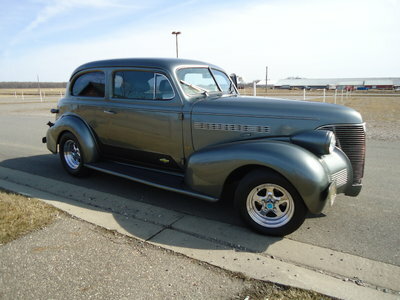 It dates from the ‘40s when Ira Swindler, who worked for Hal Hasterman at Hal Race Engines, built it in Akron, Ohio. 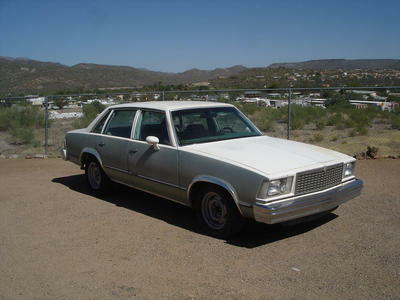 A new head, valve cover, water pump, intake manifold, water tube manifold, dipstick assembly and carburetor were cast. The carburetor started as two broomsticks glued together. The carburetor and valve cover have “Miller” cast in them. The oil service assembly, fan and push rod covers were handmade. 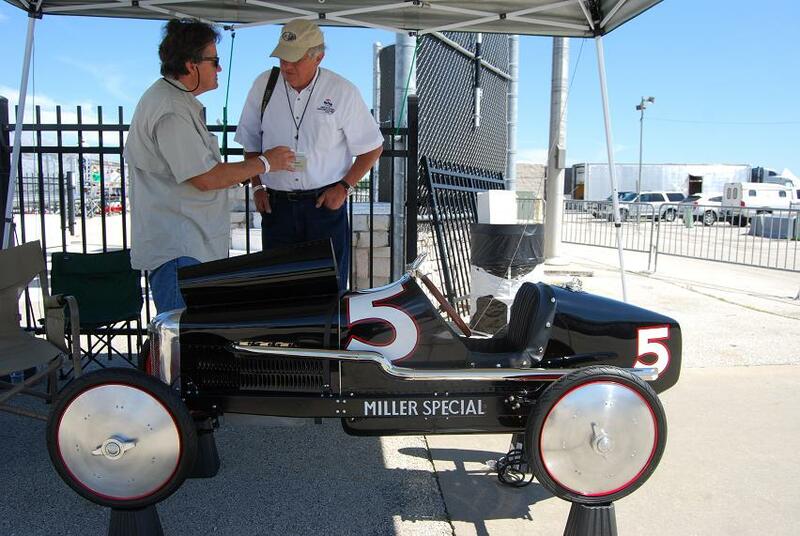 Manhart (L) shows the scaled down Miller to Bill Warner (R), chairman of the Amelia Island Concours d’Elegance. Manhart built the steering box from a lawn mower. He made a pressurized gas tank using a bicycle air pump. The windshield was made from angle iron purchased at Lowes and nickel plated. Manhart worked on the car for 10 years off and on. According to him, the project sat for most of the last seven years, while he was working for American Airlines. 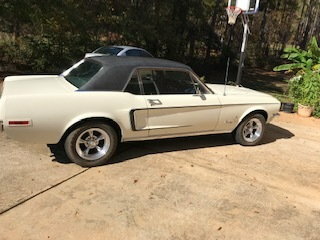 When he retired and moved to Florida, he joined the Harry A. Miller Club and set himself a deadline to finish the project. 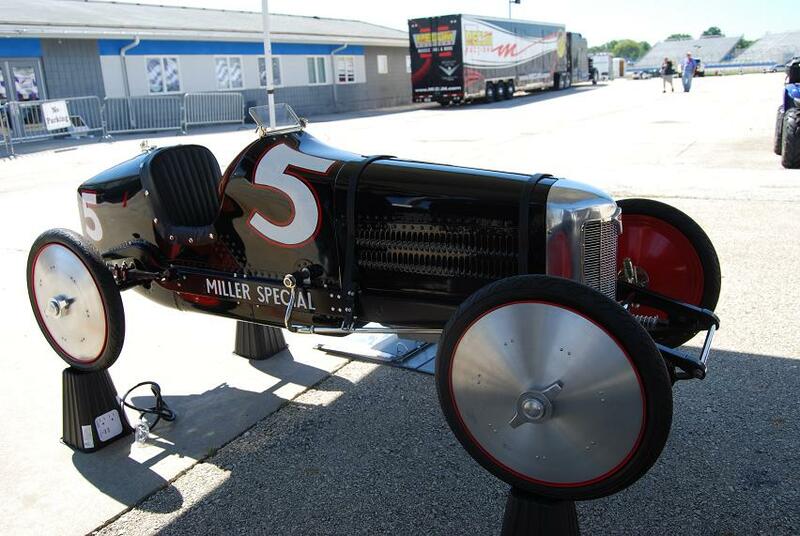 Photos from The Miller Dynasty book were the inspiration for the design and the body work.